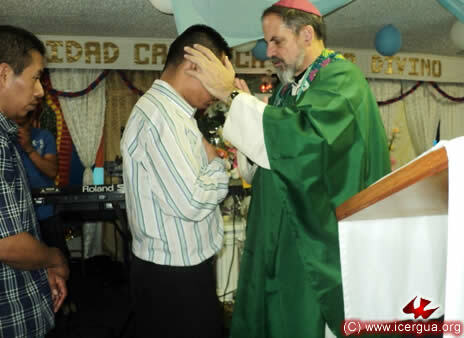 At midday on Thursday, August 4, the bishop presided at the celebration in which Sub-Deacon Orlando López was ordained as Deacon. 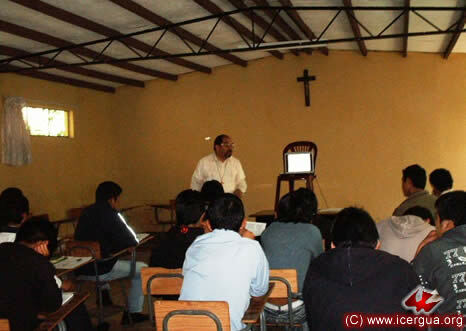 Orlando did his supervised field work as a participant in the instruction team at the Seminary. 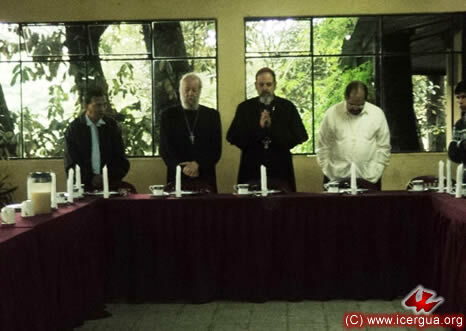 Fathers Rigoberto Upú (Vicar General), Francisco Simón (Pro-Vicar General), Vicente Gómez, who is in being incorporated into ICERGUA, and Father Juan Moisés Mendoza, Vice Rector of the Seminary were also present at the celebration. In an atmosphere of deep spirituality, the ceremony followed the Old Latin Orthodox Rite. After the Litany of the Saints, the consecrating prayer began. At the end of its first part, the bishop proceeded to the laying on of hands. The consecrating prayer and the laying on of hands form the center of the diaconal ordination. 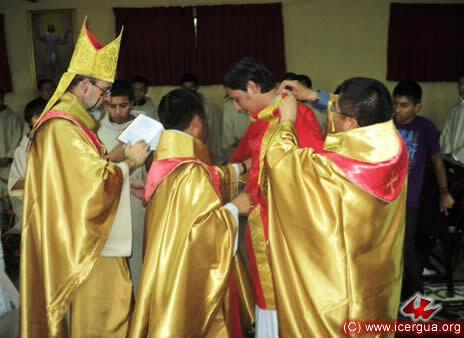 Fathers Francisco and Rigoberto help the bishop re-clothe the new deacon with the vestments proper to his ministry: the diagonal stole and the dalmatic. To end the rite of ordination, the bishop gave to the new deacon the book of the Gospels, by which is signified that his ministry must consist of proclaiming the whole Gospel and living it in every aspect of life. 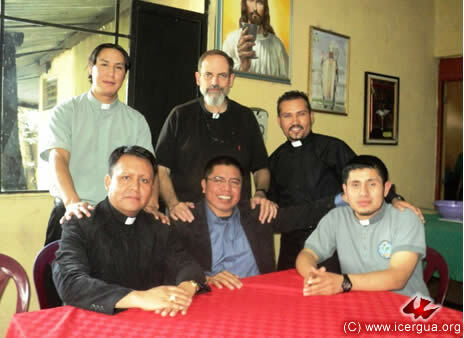 Right: From left to right: Father Vicente, Father Rigoberto, Deacon Orlando, Bishop Eduardo, Deacon Yaider, Father Francisco, and Father Juan Moisés. 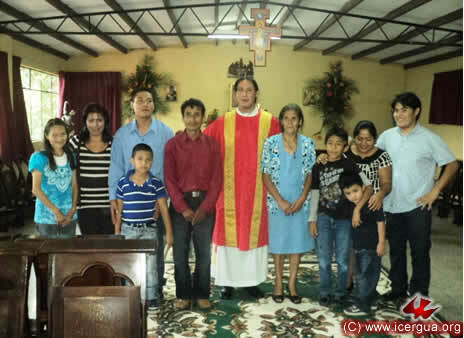 Left: The new deacon accompanied by his parents, brothers and other family members who were with him for this significant event. After lunch, the bishop and the deacons with Fathers Rigoberto, Francisco and Juan Moisés. 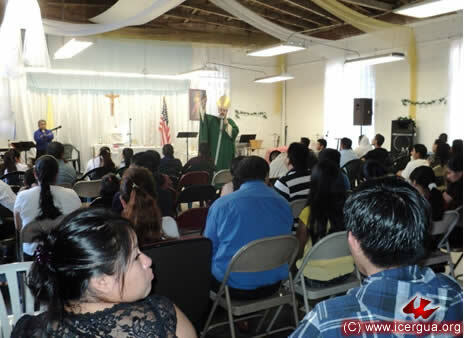 On Saturday, September 6, the bishop made his monthly visit to the San Miguel Arcángel Parish in Los Angeles, California. The community showed signs of having passed through a time of reorganization, hope and growth. The Saturday Eucharist was accompanied by one of the parish music ministries. It is characterized by its use of instruments indigenous to Guatemala, among which the marimba has a special place. In the homily, the bishop dwelt on the importance for Renewed Catholics of having a living experience of faith, which brings about a positive change in life. He urged them to continue proclaiming the Good News in spite of the difficulties that they frequently encounter. 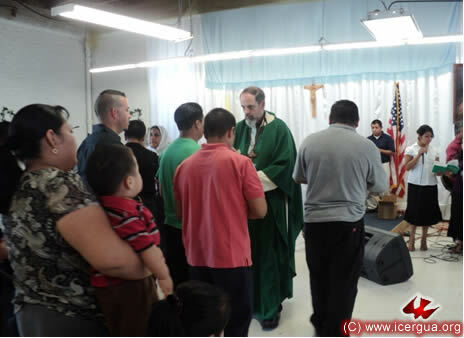 In late afternoon, the bishop visited the Pacto Divino Community, located on Sixth Street in downtown Los Angeles. The members of the community give signs of enjoying very positive times. They have been blessed with new members and soon they will begin to prepare for their anniversary, which will be celebrated in early October. 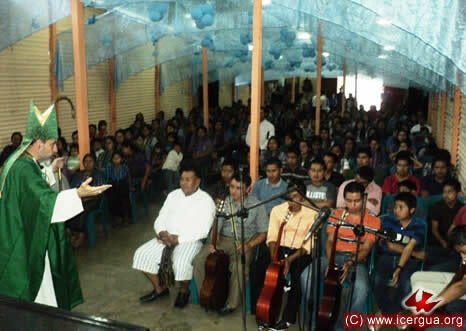 One of the problems for this community has been the lack of a music ministry. 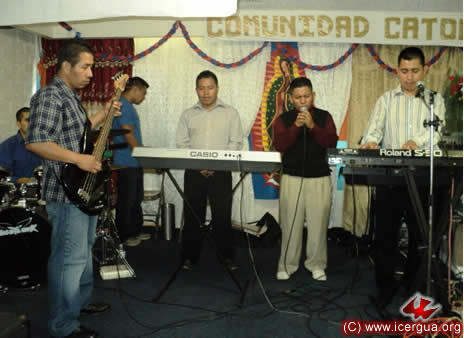 With much effort, they have now organized a fine ministry, whose musical quality is steadily improving. Right: The bishop imparting Absolution to members of the music ministry after the confession of sins. Left: The ministry singing the “Lord, have mercy” and the “Gloria” for penance and thanks for Absolution. Most of the participants in the celebration came forward for the sacrament of Reconciliation. Right: Some of those receiving Absolution. 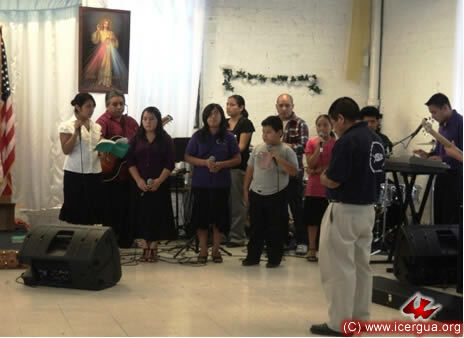 In the evening the bishop ended his ministerial work by visiting the Restauración Community, located on Third Street in downtown Los Angeles. Left: Those who had confessed their sins coming forward for Absolution. This community is well organized. The Most Holy Sacrament is permanently present in the community’s house of prayer, and there are two communion ministers who can distribute the sacrament when the faithful meet and there is no Eucharistic celebration. 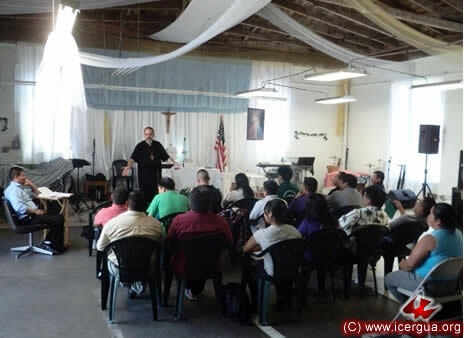 On Sunday, September 7, a large group met in the see of the El Pescador Ministry, which is also the Parish see, located on Jefferson Street at Hill Street. 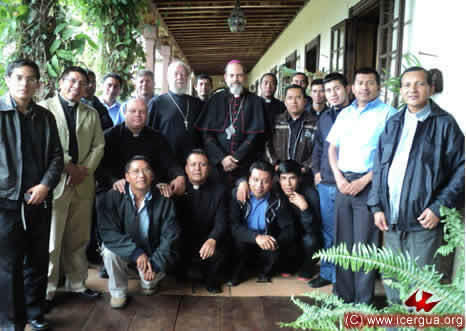 Although the letter seems to focus on the current situation in Guatemala, the dialogue between the bishop and the participants enabled them to become aware that also in Los Angeles the Lord is conferring a specific mission on each of the Renewed Catholics, which is to bring signs of hope into every situation and to be concerned to help the neighbor with whom they live and come into contact every day. 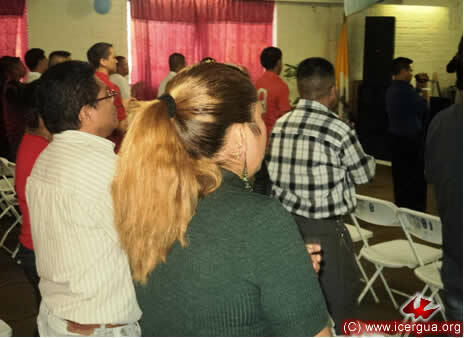 The bishop’s visit to Los Angeles ended with the celebration of the Eucharist, in which the DETYM students and other members of the El Pescador Ministry participated. 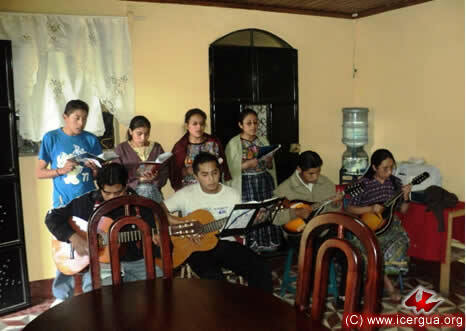 The musical accompaniment of the Liturgy was in the hands of the ministry coordinated by brother León Velásquez and which consists mainly of children and young people. For every Renewed Catholic, the Eucharistic celebration is the center of spiritual life and the fundamental source of nourishment. 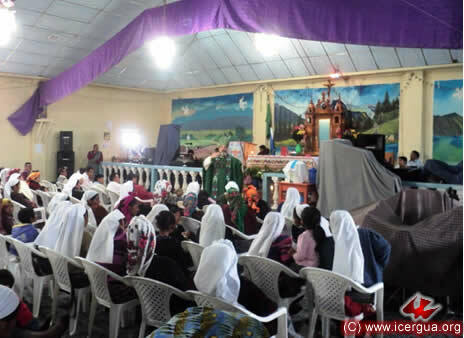 Awareness of the descent of the Holy Spirit when the Church was born on Pentecost maintains the communities’ vitality and continuously transforms and sustains their life precisely through the Eucharistic celebration and participation in Holy Communion. 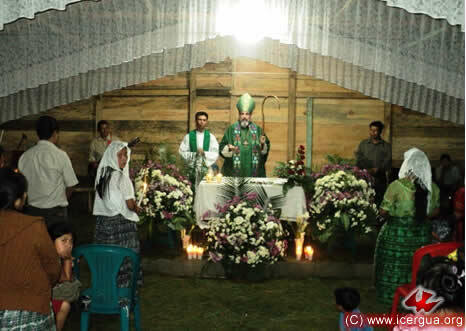 On Thursday, September 11, the bishop visited the Pajomel community in Santa Cruz La Laguna. As always, the faithful were eagerly awaiting the bishop’s arrival, and participated with great enthusiasm in the celebration. 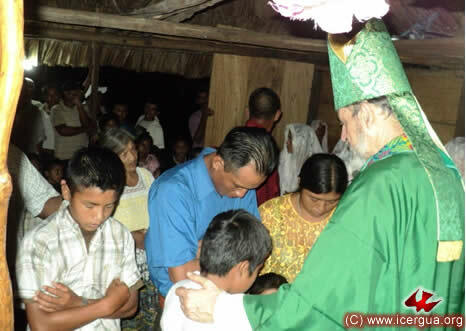 In late afternoon on September 11, the bishop visited the Chuitzanchaj Community in Santa Cruz La Laguna, Sololá. 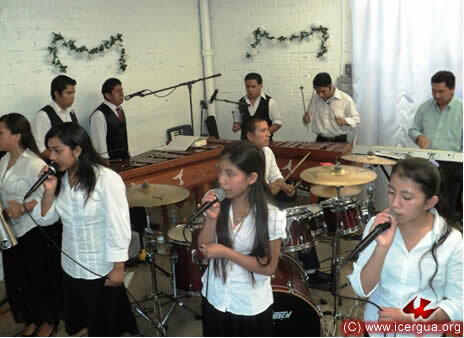 The community’s musical ministry, coordinated by brother Lucas, is distinguished by its great enthusiasm and by its constant search for new ways of praising the Lord. This commitment continuously keeps the community united and growing. After the sacrament of Reconciliation, almost all the faithful participated in communion. 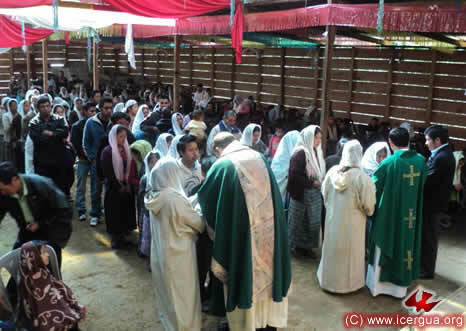 More than one hundred brothers and sisters came forward for communion. 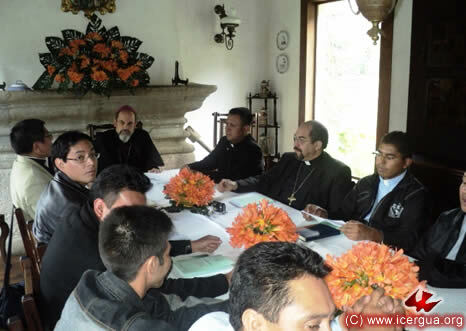 On Friday morning, September 12, the bishop was in Santa Eulalia to participate in the Deanery of Central Huehuetenango. This deanery consists of four parishes: Nuestra Señora de Guadalupe de Soloma, Santa Eulalia, San José (located in the villages around Santa Eulalia) and Santos Arcángeles (San Rafael La Independencia, San Miguel Acatán, and San Sebastián Coatán). 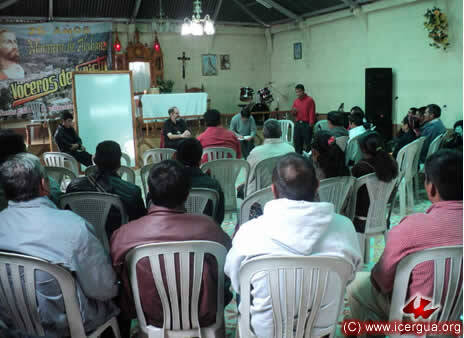 The community representatives told of the many successes that they have enjoyed this quarter: substantial growth, the rise of a new community, and the consolidation of the instruction and evangelism programs. 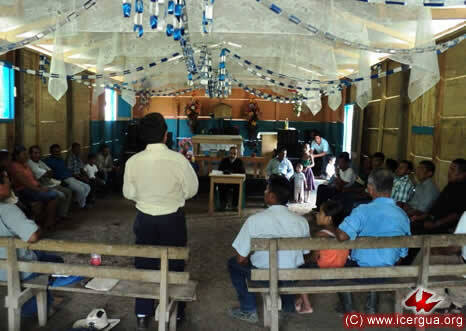 As always, the bishop listened to the presentations made by the community representatives and then the reports from the two presbyters who do pastoral work in the area, Fathers Fredi Aníbal Mux and Felipe Corimanya, before he spoke. 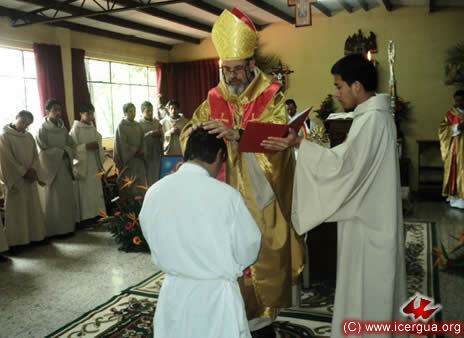 The bishop responded to several issues that had been put forward and submitted for the group to consider the advice that we should take on gradually as the official ritual of ICERGUA the Catholic ritual used in the West before the Great Schism, thus administering the sacraments of Christian Initiation as it was done at that time. 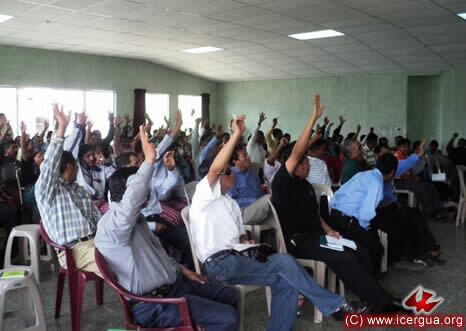 The faithful unanimously expressed joy and acceptance of the bishop’s proposal. 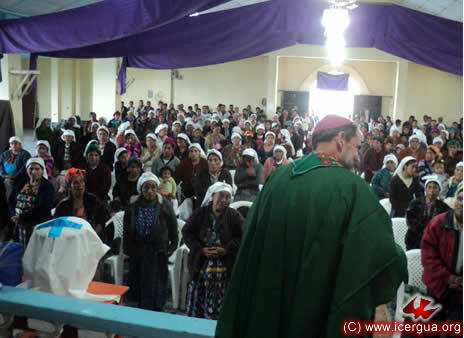 On the afternoon of August 12 the bishop visited the Coloaj Community in San Rafael La Independencia. 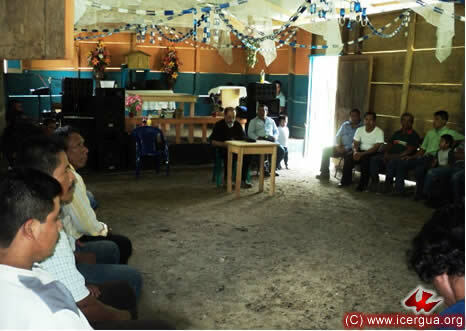 This community is the first one in the municipality of San Rafael La Independencia to covenant with ICERGUA, and always shows great vitality and enthusiasm. 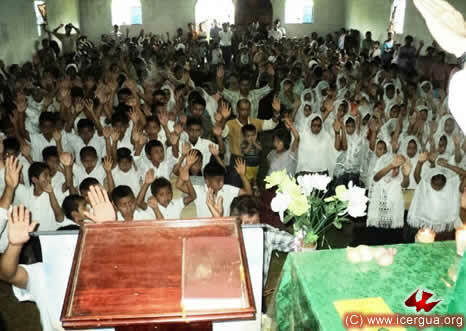 Above: The faithful at prayer, imploring the outpouring of the Holy Spirit, after confessing their sins and before coming forward to receive Absolution. Right: The bishop’s homily, which dwelt on the faithful’s commitment to live as authentic Renewed Catholics. The Assembly came forward in great numbers to participate in communion, as it always does. Before the Eucharist, they had confessed their sins and received Absolution, and now they needed nourishment to persevere on the path of truth and life. 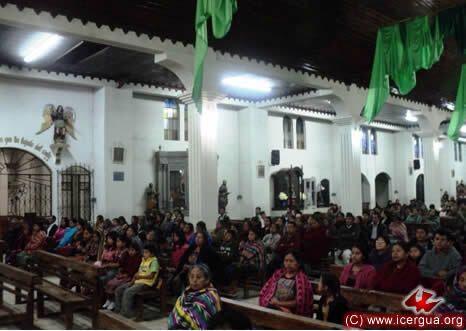 On Saturday, August 13, the Deanery of North Huehuetenango took place in the central see of Santa Cruz Barillas. 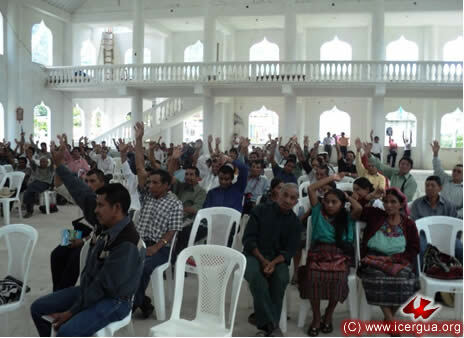 There were representatives from the seventy communities of the municipality of Barillas and the numerous communities of the municipality of San Mateo Ixtatán. 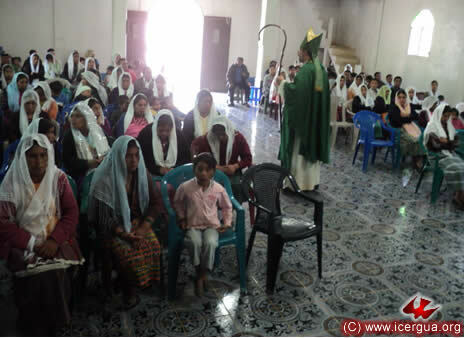 The procedure followed was the usual one: the faithful presented the situation prevailing in the various sections, the presbyters made their reports, and at the end the bishop responded to questions and ideas and made some recommendations. The Parish of La Glorificación de María in Santa Cruz Barillas consists of six sections and these in turn have sub-divisions. 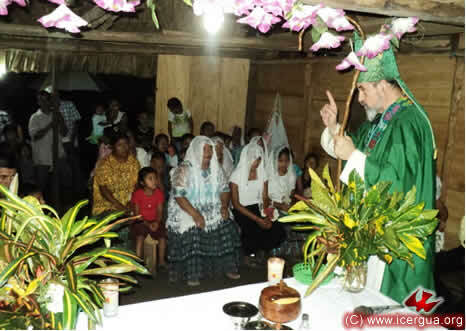 The communities of Nucá and those of San Mateo are also in the process of organization in order to be established as parishes in the near future. During the second part of the meeting, the bishop offered instruction. As in the previous deanery, besides the presentation of the Third Pastoral Letter, there was a discussion analyzing the suitability and advisability of adopting as ICERGUA’s official rite the Latin Catholic rite that was used in the Old Western Church, looking ahead to the possibility of a Communion of Churches that share the same faith and celebrate using liturgies that come from antiquity. At the end of the instruction period, there was a non-binding, consultative vote on the suitability of gradually implementing the Latin Liturgy used by the undivided Church. As can be seen in the photograph at right, the approval of the People of God was practically unanimous. 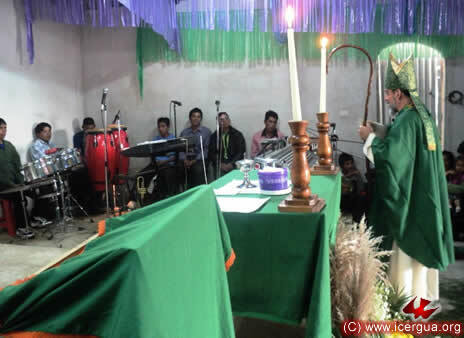 On the afternoon of August 13 Monsignor Eduardo presided at the celebration of the Eucharist and the ceremony of confirmations in the Manantial Carretera Community, located about four kilometers from the center of Santa Cruz Barillas. Those who were confirmed had been well prepared and unanimously expressed their commitment to live the faith as the apostles lived it and to announce the Gospel to everyone. Above and right: Two moments during the celebration. The young people who had been confirmed and who, after taking communion, lit candles as a sign of promising to be a light to the world, are asking the Lord for the grace to be faithful to the gift they have received. 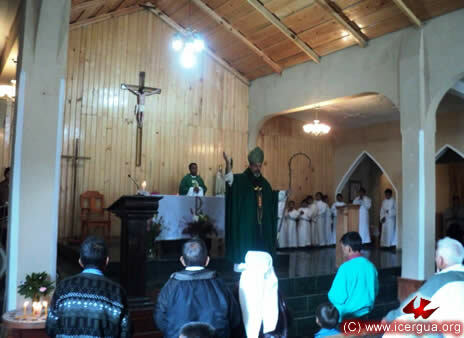 In late afternoon, the bishop presided at Eucharist in the Parish of Barillas. 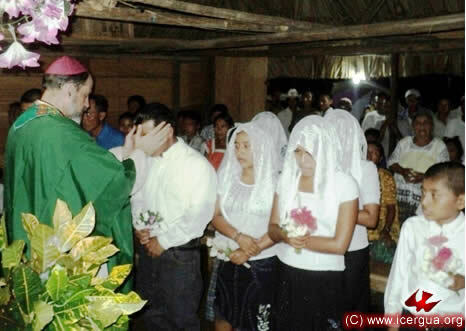 During the ceremony several of the faithful were installed as Communion Ministers, and the new board of directors of Radio Carisma received the Community’s blessing. The homily explained, in the light of the Readings, the specifics of the Renewed Catholic identity and what should be the distinguishing marks of our style of life and apostolicity. After the homily, Monsignor Eduardo addressed those who were to be installed as ministers, reminding them of the characteristics they must have both in their lives and in the way they exercise their ministry. 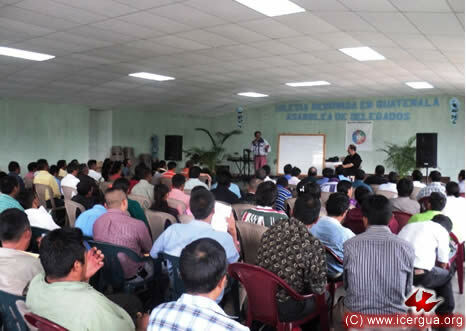 He reminded the members of the radio station that the function and mission of this means of communication is that of direct and explicit evangelism, and that requires that high and clearly stated standards be applied to all its programming. On Sunday morning, August 14, Monsignor Eduardo presided at the Eucharistic celebration with the Nucá, Barillas, Community. 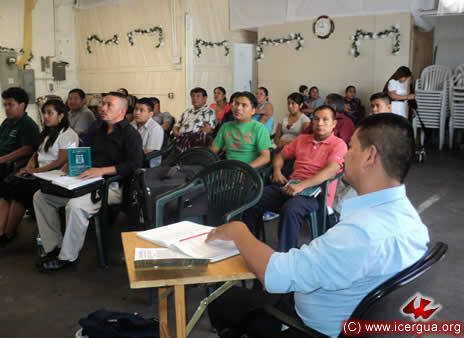 This community and others in the vicinity are preparing to become a parish on January 6, 2012. 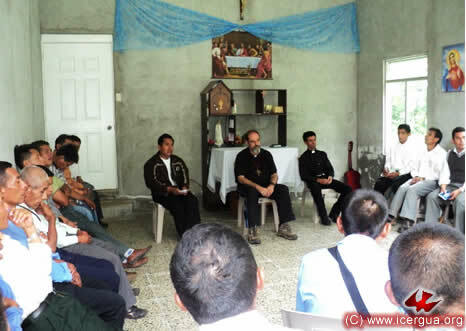 Father Marcos Caicedo, pastor for the area, has worked arduously to organize the pastoral work in the area as well as to improve the community materially. The team of altar boys and girls for the parish in formation has been carefully prepared. Each member of the team knows exactly what is to be done by whom and has learned all the liturgical responses so that the celebration flows smoothly and meaningfully. 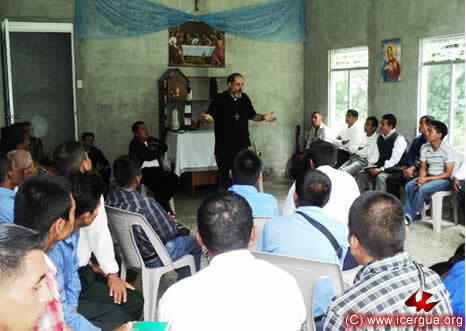 One of the special means of evangelism in this parish-in-formation is the radio. 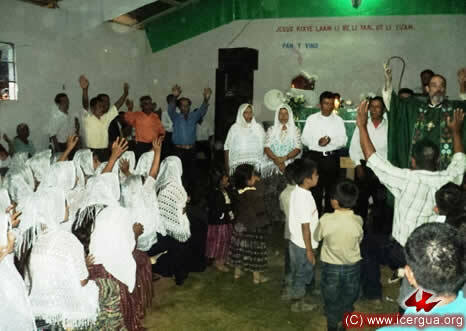 Radio Nueva Vida broadcasts programs to the entire region and in this way the life of faith in Nucá has an impact on many other places. 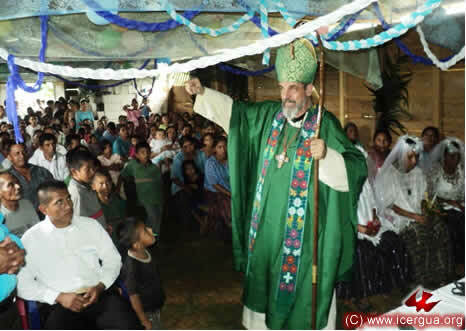 In late morning on Sunday, August 14, the bishop visited the Nueva Jerusalén Community in the center of San Mateo Ixtatán for the first time. This community came into being as a Charismatic Renewal Community. Then it began to follow a somewhat Protestant path, and recently felt called to become a Renewed Catholic Community. 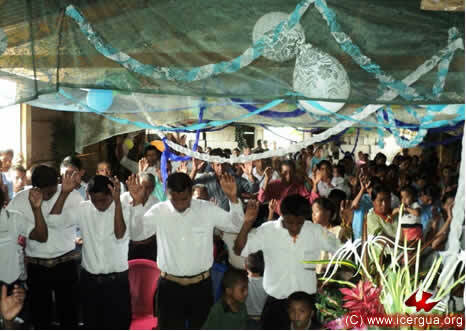 The faithful are enthusiastic and eager to work hard in the consolidation of their faith. Two Communion Ministers were installed during the ceremony to serve the community. 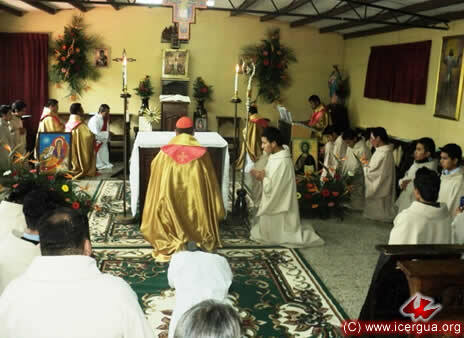 The Sanctuary was blessed, allowing the permanent presence of the Most Holy Sacrament, beginning with this celebration. 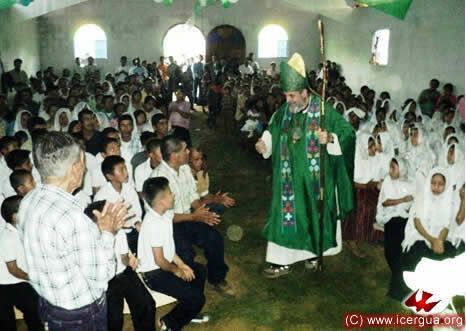 On the afternoon of August 14, the bishop visited the central community of San Mateo Ixtatán. The building was completely filled. 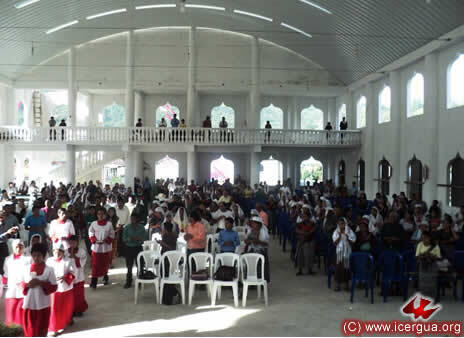 The community is joyfully announcing the construction of an enlargement of its church is now complete. It will accommodate 50% more people than had been the case before. It is a practical response to the substantial growth that the community has experienced in recent years. The ceremony began with the confession of sins. Right: The bishop invoking the outpouring of the Holy Spirit so that pardon may be granted to those who have recognized their sins. In the central community there is a series of hopeful signs. Substantial growth has been sustained, and the difficulties associated with the death of brother Baltazar, who for many years was the community coordinator, have been overcome. With the help of Father Marco, its identity and its practice as Renewed Catholics have been firmly established. On Tuesday, August 16, the new pastoral council of the Renewed Catholic parish came to the seminary to participate in the Eucharist and to ask our bishop to swear them in so that they could exercise the responsibility to which they were elected. Going to the bishop for this action is unusual. It comes from their desire that their outward behavior comport with their inner faithfulness and sense of belonging to the church. Above: After the homily the bishop and the other celebrants prayed for each of the brothers. Right: The brothers making the profession of faith, which served as the ritual leading to their being declared suitable to accept the responsibilities to which they had been chosen by their parish. AUGUST 19. 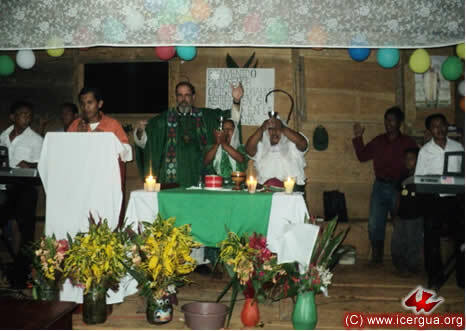 CHRISTIAN INITIATION IN THE EFUSIÓN DEL ESPÍRITU SANTO COMMUNITY, SANTIAGO ATIT. 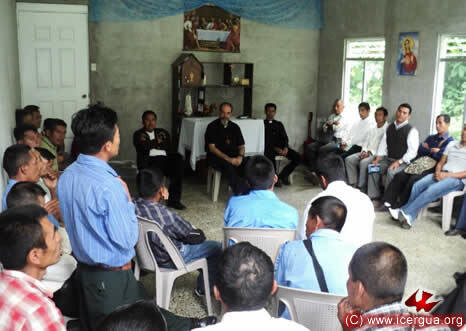 On Friday afternoon, August 19, Monsignor Eduardo visited the Efusión del Espíritu Santo in Santiago Atitlán. 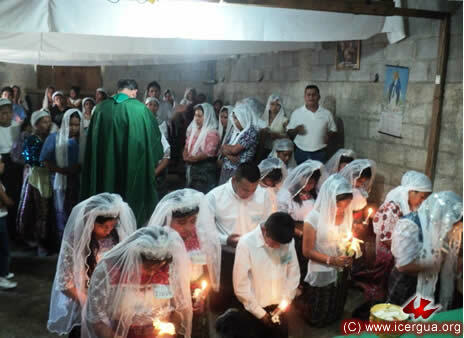 The faithful had prepared a marriage and the Christian Initiation of several children to take place within the monthly Eucharistic celebration. 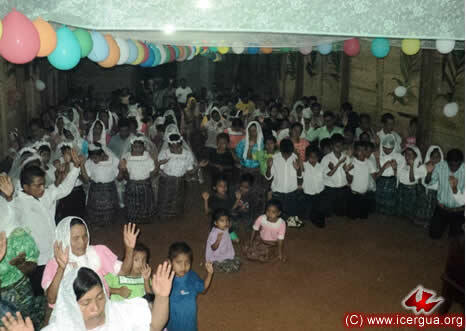 Several hundred faithful attended the celebration. The choir accompanied the entire liturgy with great care. 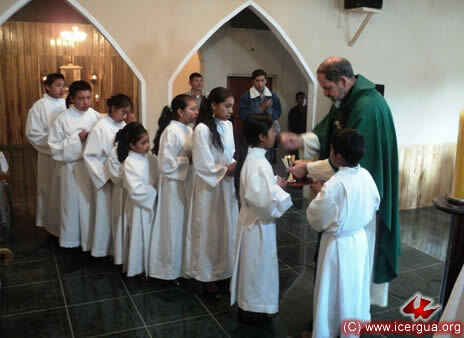 Through receiving communion, the children who had been baptized and chrismated completed their Christian Initiation, as can be seen in the photograph at left. 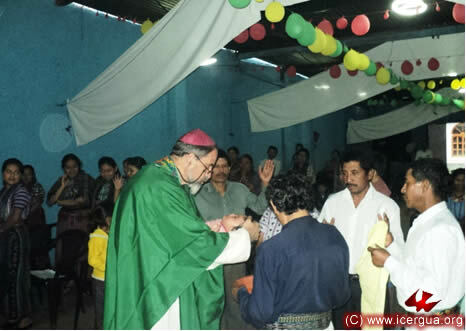 In late afternoon on August 19, the bishop celebrated Eucharist with the Pentecostés Community, also in Santiago Atitlán. 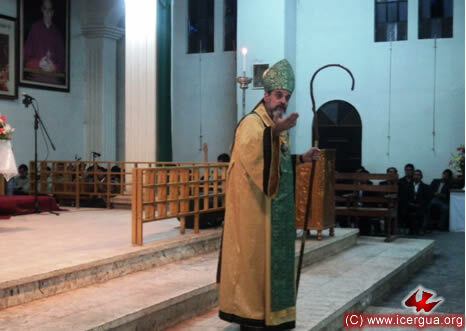 The homily emphasized the basic meaning of the church, namely that it is built on the rock of Christ and confession of faith that He is Lord and Messiah. 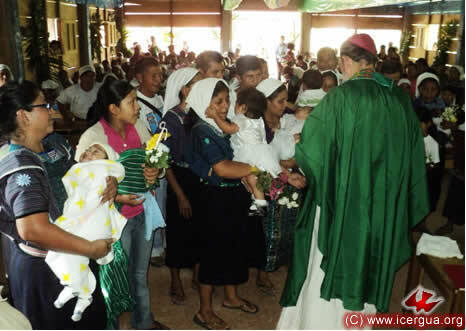 Right: Within the celebration, the Christian Initiation of several children took place. 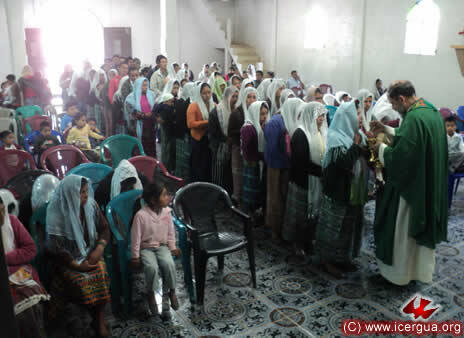 On Saturday, August 20, the quarterly Assembly-Deanery took place in the Education Center in Huehuetenango. 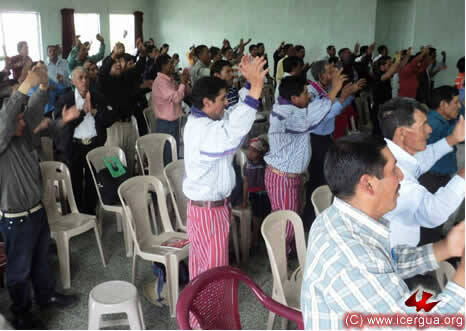 Present were about two hundred leaders, coming from the southern Huehuetenango communities. The meeting began with some warm-up activities, as can be seen in the photograph at left. The representatives of the various parishes, regions and sectors that come together for the Assembly made reports on their communities. On balance, the reports were very positive: there are many new communities, and the communities already in existence have grown substantially. 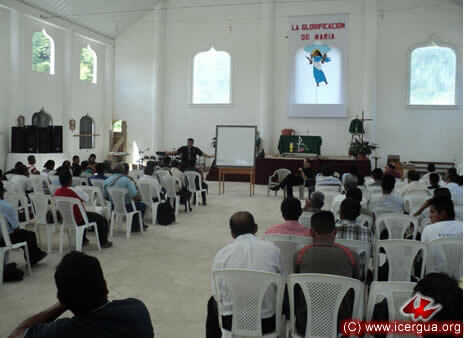 After the leaders’ reports and those of Fathers Pedro Martínez and Marco Tulio Calderón and Deacon Yaider Jiménez, the bishop raised several questions about the future of the Church, which the Presbytery will discuss at its meeting on Tuesday, August 23. Several motions were made and after ample discussion were submitted for the Assembly’s approval. Right: Taking the vote on one of the issues. 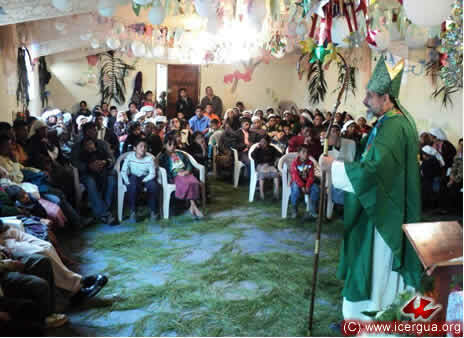 On Saturday afternoon, August 20, the bishop visited the Nuestra Señora de Guadalupe Parish in Soloma, Huehuetenango. The occasion of the visit was to celebrate the anniversary of the original community, called La Nueva Alianza. 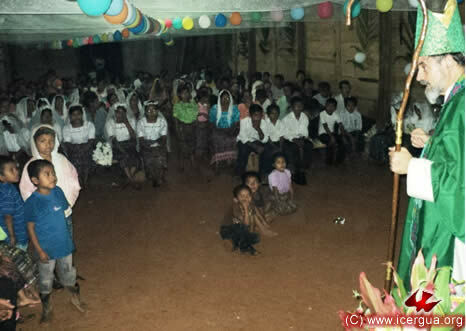 Right: In spite of a heavy rain, a huge crowd of the faithful attended the celebration. On Sunday morning, August 21, the bishop went to visit the Renewed Catholic Parish of Santa Eulalia in order to preside at the morning celebration of the Eucharist. The parish has acquired a large, centrally located property on which to build a church. While construction is going on, they will meet in a good-sized temporary church, especially for Sunday Eucharists. In the center of Eulalia there are three other, smaller churches: Belén, San Miguelito, and San Martín. The bishop could see the sustained growth of the community. The last time that he had presided at the Eucharist had been Easter Sunday. From then until now, the active participation has increased by about 15%. 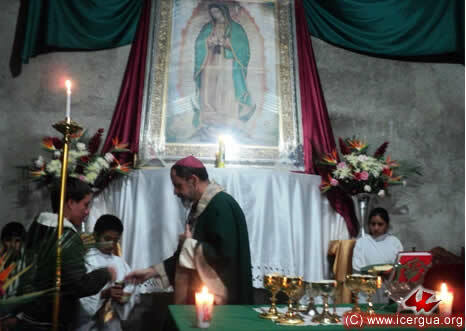 On Sunday afternoon, August 21, the bishop presided at the Eucharist in the San Juan Bautista Cathedral, Comalapa. As always, the faithful had met in great number. It was the first time the bishop had presided at the 6:00pm Eucharist. This Mass was added last year especially for merchants who otherwise would not be able to attend a Eucharist. As result, the bishop was able to greet many parishioners he had not met before. The homily explained the meaning of Matthew 16:18, which had been proclaimed during the Sunday Liturgy of the Word. The bishop emphasized that the stone on which the church is built is Christ. 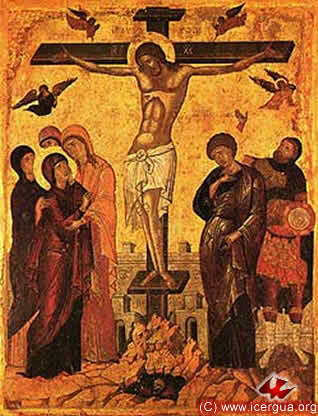 By confession of faith in Him as Messiah and Lord, we are also living stones for the construction of the Church. He also explained how the power of binding and loosing is directly linked to the confession of faith, which is what justifies human beings and makes what is bound or loosed on earth also to be bound or loosed in heaven. 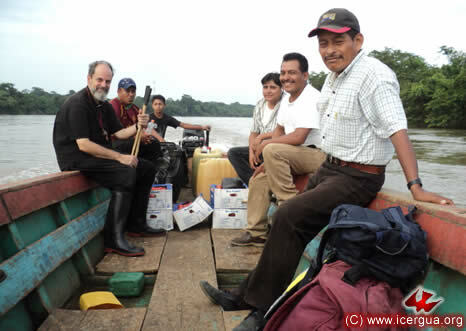 On Monday, August 22, Bishop Jerome came from Manhattan to Guatemala. He is Vicar of the Russian Orthodox Church Outside Russia (ROCOR), for the Western Rite. 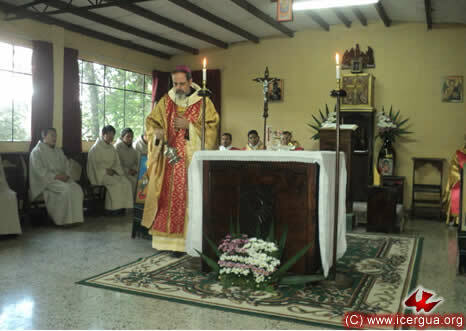 His visit was of a private, not an official, nature, although for us it was a great blessing, for we had committed ourselves to make our liturgy correspond completely to the Latin Liturgy used in the West before the Great Schism and he, having dedicated many years to the study of the various ancient Western liturgies, is a specialist in this field. 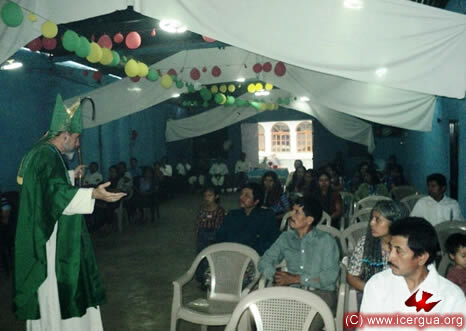 Bishop Jerome shared five days with us, from Monday, August 22, until Friday, August 26, when he returned to New York. On Monday a concert in his honor was given in the Chamber Theater of the Grand National Theater, followed by dinner in Zone 10 of Guatemala City. 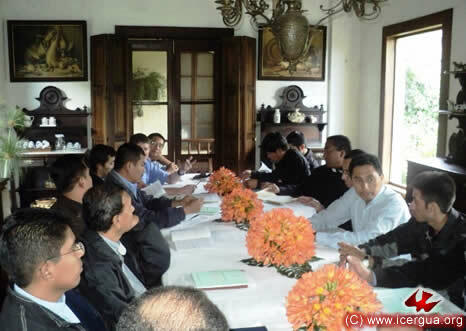 On Tuesday, August 23, in the Carmona House in Santa María de Jesús, Sacatepéquez, the meeting of the ICERGUA Presbytery took place. 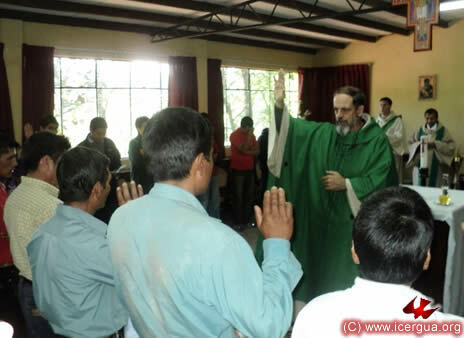 In addition to all the presbyters who work in Guatemala, Father Nicolás de Jesús Gómez de la Motta, Vicar General in the Mexico Mission was also present. Right: The Presbytery. 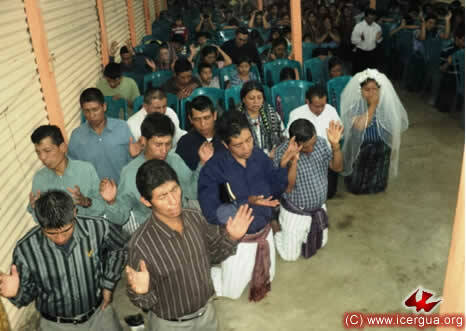 Front row, kneeling, from left to right: Fathers Rigoberto, Hugo, Felipe; standing behind them, left to right: Fathers Fredi Mux, Francisco, Denis, Santos, Herberth, Marco Tulio, Bishop Jerome, Father José Armando, Bishop Eduardo, Fathers Marcos, Fredy González, Gildardo, José Ángel, Juan Moisés, Pedro, and Vicente. Father Nicolás is not in the photograph because he was the one taking the picture. 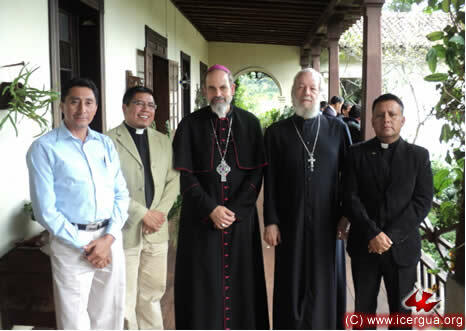 Left: The bishops with the members of the Presbytery Council. From left to right: Fathers Santos, Francisco, Monsignor Eduardo, Monsignor Jerome, and Father Rigoberto. 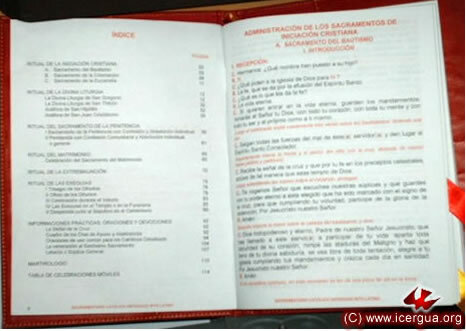 At the meeting, in addition to reports on the progress of the individual parishes, there were three topics: The establishment of the Communion of Latin Orthodox Catholic Churches, the approval of the Old Latin Rite as the official rite of ICERGUA, and questions pertaining to the education, selection, and care of candidates for becoming presbyters in the Church. 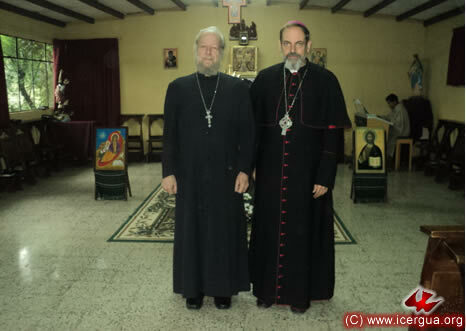 After an in-depth dialogue, the decision was taken to found a new organization, called the COMMUNION OF LATIN ORTHODOX CATHOLIC CHURCHES (CICOL). 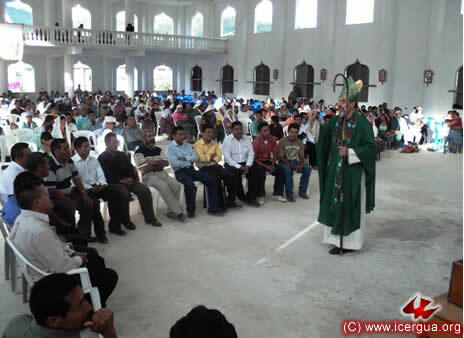 For pastoral and contextual reasons, in Guatemala it will be called the Communion of Renewed Latin Catholic Churches (CICAREL). The goal of this communion, under the presidency of ICERGUA, is to encourage unity among the churches that profess the orthodox catholic faith in its integrity, that celebrate the liturgy with some of the ancient Western rites and that are keen on maintaining the same characteristics of church organization that the undivided church had during the first millennium. 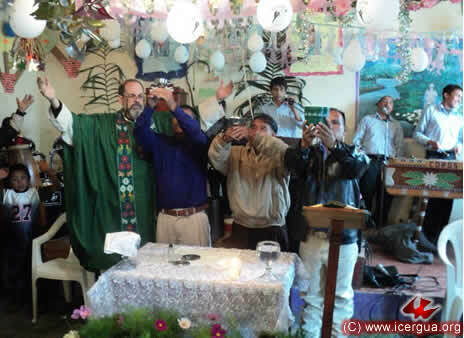 Initially the Communion is comprised of ICERGUA and the Renewed Catholic Vicariates of Mexico, Venezuela, and California. 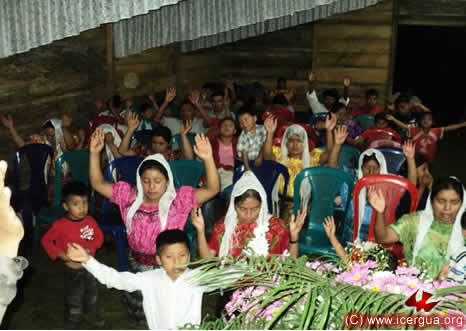 There are two reasons why the word “Renewed” is substituted for the word “Orthodox” for the church in Guatemala. First, for us, the meaning and implications of the two words are synonymous, for by “Renewed,” we understand the Church that was born on the Day of Pentecost and then was witnessed to and organized by the Apostles and Church Fathers. 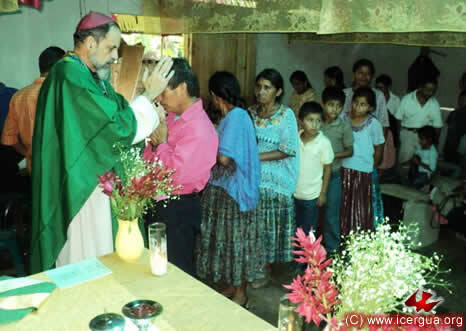 Second are pastoral reasons, for in Guatemala there are church organizations that call themselves “Orthodox,” but use the term in a sense very different from the meaning it has for us. The Presbytery also approved the use, on an experimental basis, of the Old Latin Catholic Sacramentary, with a view to promulgating it as the official rite of ICERGUA after a time of experimentation, which will include amplifying it by introducing other ancient anaphoras. For pastoral reasons, however, this does not imply that use of the Renewed Catholic rites now in use will be removed. The sacramentary foresees Christian Initiation as a unity. Within the Liturgy of the Mass the Anaphoras of St. Gregory (Ancient Roman Canon), of Saint Hippolytus of Rome, of St. John Chrysostom and St. Thikon. It is anticipated that in the future it will also include the anaphoras of St. Basil, St. James, and St. Mark. On Wednesday, August 24, the solemnity of St. Bartholomew the Apostle, the Divine Liturgy was celebrated at the Seminary. 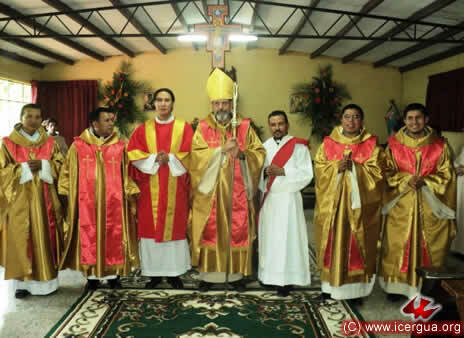 The bishop, Monsignor Eduardo, presided, and the presbyters present co-celebrated; ICERGUA’s two deacons were also present and performed diaconal duties. Bishop Jerome attended as a special guest. The Old Latin rite, which had been approved at the Presbytery meeting on the previous day, was used for the celebration, and the anaphora of St. John Chrysostom was prayed. During the homily the bishop emphasized that the figure of St. Bartholomew the Apostle offers us an invitation to set aside all prejudices and conditionalities in order simply to meet Jesus Christ and be able to bear witness to his Gospel. After the Divine Liturgy in the Seminary, a meal was served in honor of our two special guests: Bishop Jerome and Father Nicolás, Vicar General of the Mexico Mission. 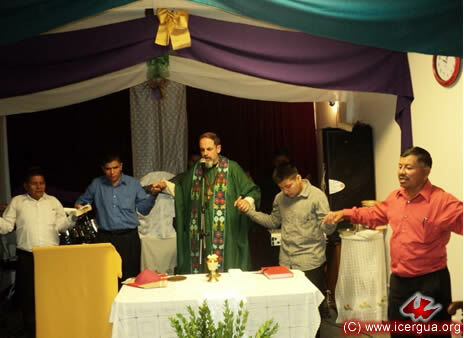 Left: Father Vicente, Bishop Jerome, our Bishop Eduardo, and Father Nicolás, during the blessing of the food. 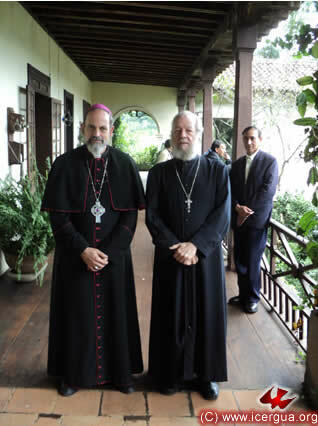 On the afternoon of August 24, our bishop invited Bishop Jerome to visit the Cathedral of San Juan Bautista, Comalapa. 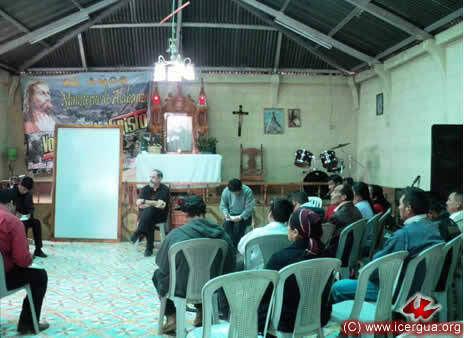 The hosts were Fathers Rigoberto and Francisco, the co-parish presbyters of the Cathedral Parish. The visit began with a tour of the colonial section, which is at present undergoing reconstruction. 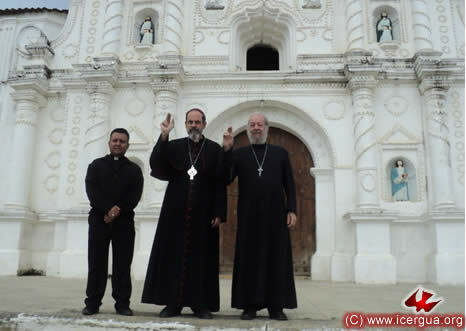 Right: The two bishops posing in front of the Colonial Church, giving the sign of blessing for all the People of San Juan Comalapa. During lunch, a group of eight young people from the parish choir, whose turn for duty in the Cathedral fell on that day, came to give a short concert in honor of Bishop Jerome. After lunch, a visit to the interior of the Colonial Church took place. 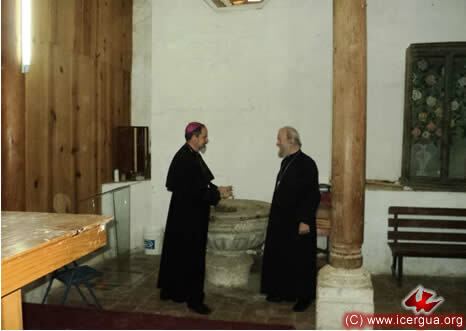 Right: Our bishop showing Bishop Jerome the baptismal font of the old church. The visit to the Cathedral ended with a walk through the beautiful plaza of San Juan in front of the Cathedral and the Colonial Church, greeting some of the People of God who happened to be there. 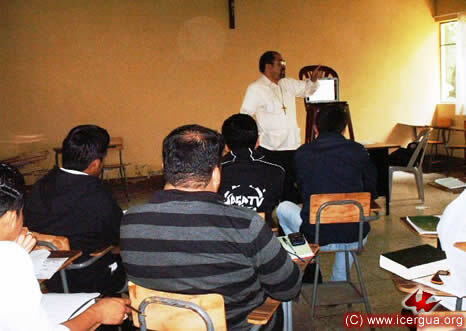 Father Nicolás de Jesús Gómez de la Motta led two educational workshops with the seminarians. Father Nicolás was pleased with the opportunity of sharing with the seminarians, and has been invited to lead the spiritual retreat that will be held Thursday, October 27. 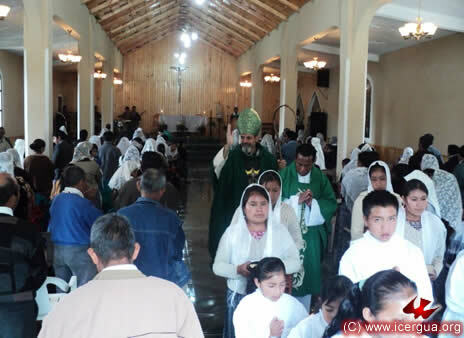 On Friday morning, August 26, our bishop traveled to Pueblo Nuevo, Ixcán, El Quiché, for the celebration of the Deanery with representatives from the Renewed Catholic Communities of Ixcán, organized into the Parish of Pueblo Nuevo and the Parish-in-formation of Santiago Ixcán. 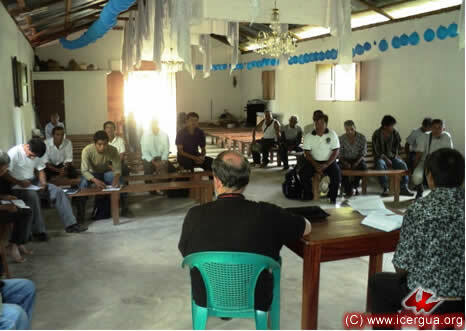 The faithful gave positive reports on the various initiatives they have begun. 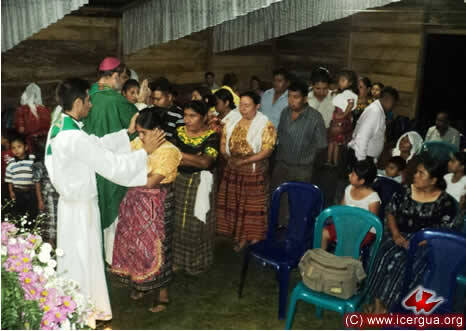 The bishop informed the Lord’s servants of the Church’s development over the past quarter and presented the Pastoral Letter, “I Saw a New Heaven and a New Earth.” He urged that it be studied by all the People of God in each of ICERGUA’s communities. 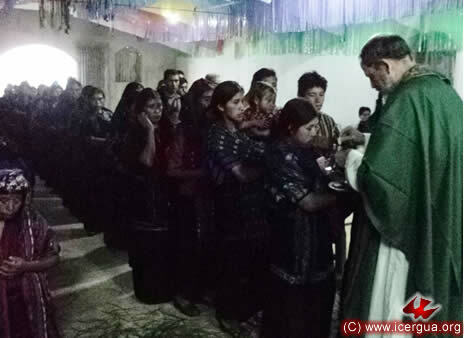 On the afternoon of August 26, with the Eucharitic celebration and the celebration of Christian Initiation for several children, the bishop opened the first anniversary celebration of the covenant of the Mayalán Community, Ixcán, with ICERGUA. 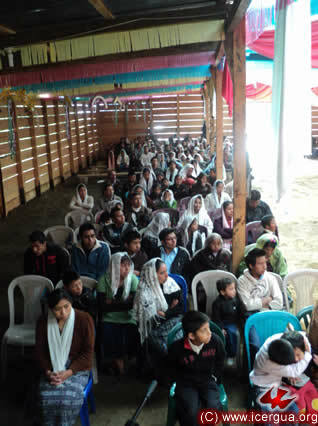 Several hundred of the faithful came to the service. They were all filled with joy. 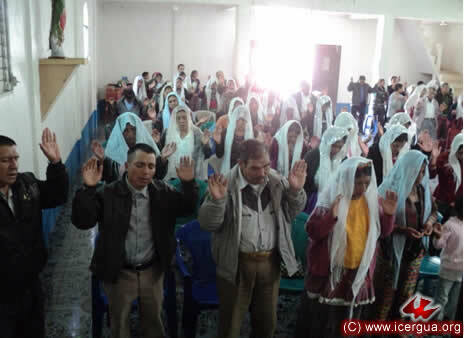 A program of prayer and praise that was to last three days had been prepared. The parents and sponsors of those initiated into Christian Life expressed their firm commitment to live their faith as authentic Renewed Catholics and to look after their children’s spiritual growth. 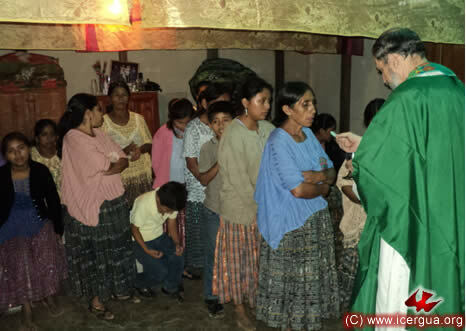 In the evening of August 26, the bishop visited the Santiago Ixcán Community in order to confer confirmation on a large group of young people and install a communion minister. After some long periods of turbulence, the Santiago Ixcán Community is now in a period of growth and expansion. In addition, the communities of San Juan Ixcán and San Antonio recognize Santiago as their center. 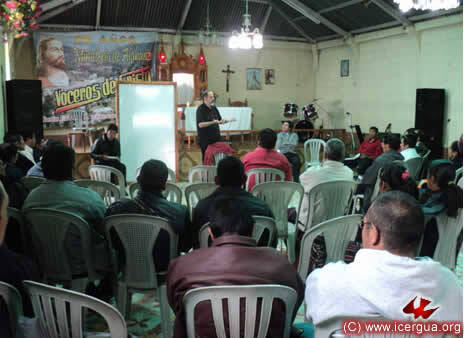 Their goal is to be elevated from being a pastoral “center” into being a parish in the near future. 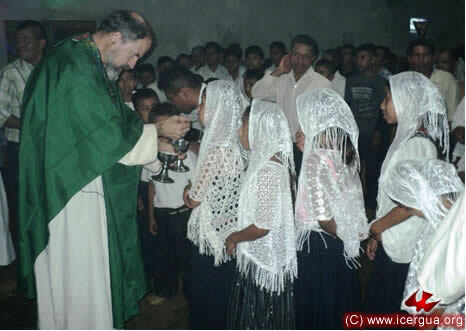 Right: At the communion, the first to come forward were those who had been confirmed. 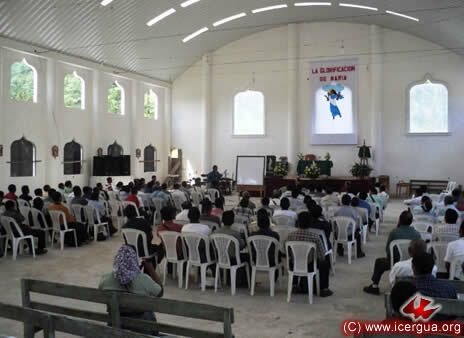 On the morning of August 27, the Deanery of Petén met in the parish seat in San Fernando, Sayajché, Petén. 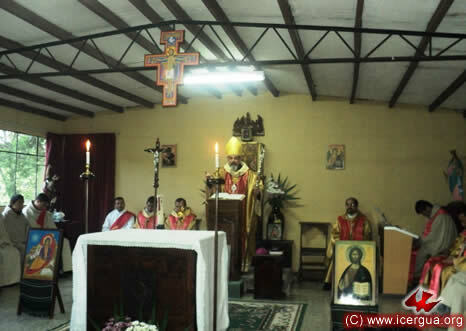 There were representatives of almost all the parishes and centers in this Deanery: the Parishes of San Fernando, Sayajché, and Chisec, and the centers of Raxruhá, La Libertad, and Santa Ana. After listening to the reports from the leaders of the various communities, the bishop responded to some doubts that had been voiced by explaining in detail the meaning and scope of being authentically “Renewed Catholic.” He underlined that the basis is being “authentically Christian,” that is, anointed by the Holy Spirit, but that being Christian is authentic only if one is “Catholic,” that is, being in accord with the characteristics that Christ wanted the church to have and that were lived in the first years of the Church. 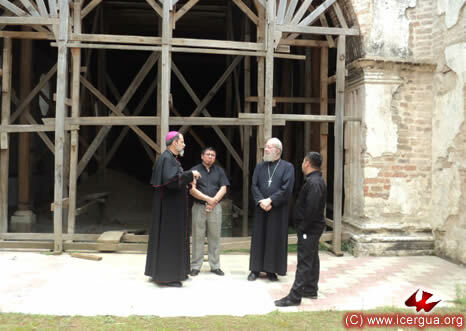 On the afternoon of August 26, the bishop went to the “Campesino Center,” a settlement in the heart of the Lacandona jungle in the municipality of La Libertad, El Petén. The trip was long; five hours in car to Técnica, then one hour by boat on the Usumacinta River (shown in the photograph at left), and then an hour and a half walking in the mountain before arriving at the community. 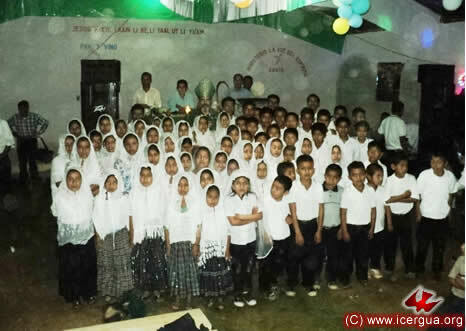 At present the community consists of about twenty families. 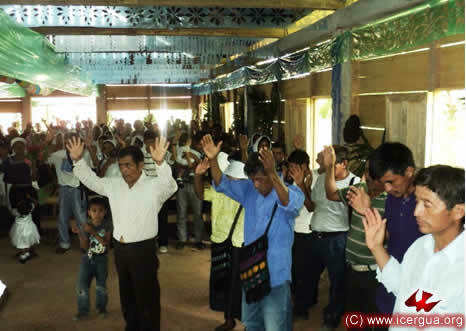 More or less half of them come from another sector, called, “Pollo Sol.” They indicated their decision to build a new house of prayer in their community in order to facilitate participation and encourage growth. This is the bishop’s second visit to the community. The first one was two years ago, when there were only two families that came together to form a community. 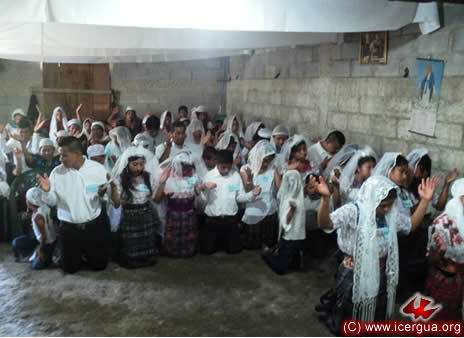 A group of young people had been prepared to receive confirmation. As advised by the bishop, they all promised to be authentic apostles of Christ and the take the good news to everyone they meet. The bishop stressed that a deep commitment to Christ and a style of daily life that comports with Christ’s love must characterize the Renewed Catholic. At the end of the celebration, an entire family was formally accepted as part of the Renewed Catholic Community. 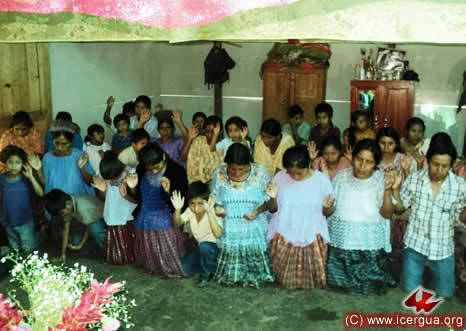 After some reflection on and details about the call that the Lord was making to them, the parents and the four children decided to present their request to be admitted into the Church and committed themselves to live accordingly. 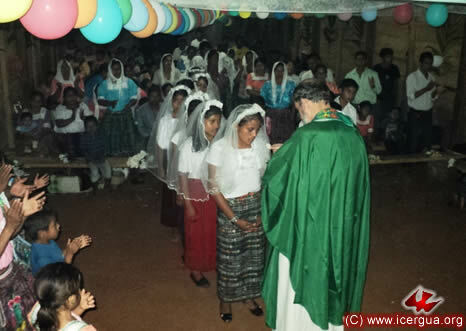 At midday on Sunday, September 28, in the midst of a multitudinous celebration, many young people were confirmed in the Sesuchaj Community of the Chisec Parish, Alta Verapaz. 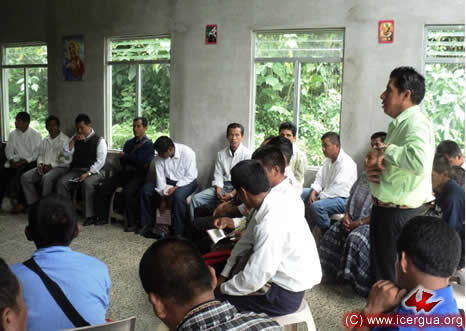 Those who received the sacrament had been prepared doctrinally and spiritually—doctrinally by studying the entire Guide of Instruction for Confirmation, which was translated last year into the K’eqchi language, and spiritually by fasting and prayer. The bishop, full of enthusiasm, commented on the Sunday readings and urged the community to move forward in its missionary commitment. 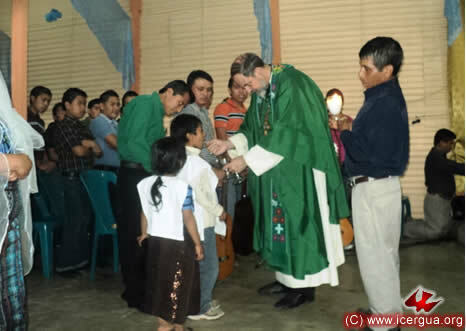 In the afternoon, the bishop presided at the Eucharistic celebration in the new community of Secontín, San Pedro Carchá. The community is located between San Pedro Carchá and Cobán. 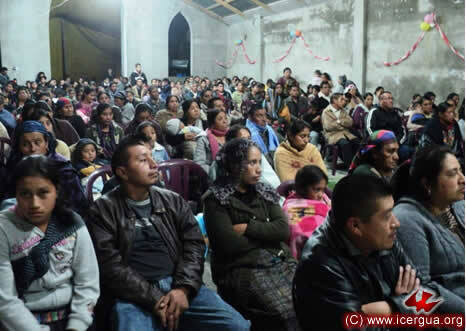 The faithful have bought a large lot on which they hope to build a church soon. In the interim they are meeting in a less formal house of prayer. On the bishop’s visit, they also installed the presence of the Most Holy Sacrament. The celebration began with the administration of the sacrament of Reconciliation for those who required it and had confessed their sins. 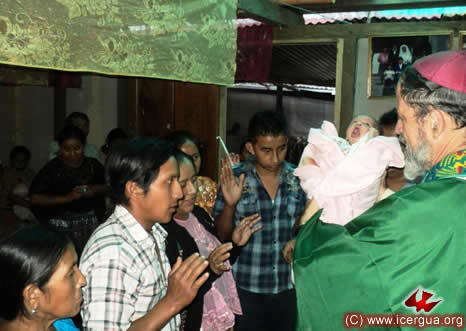 The Christian Initiation for a little girl was also carried out during the celebration. 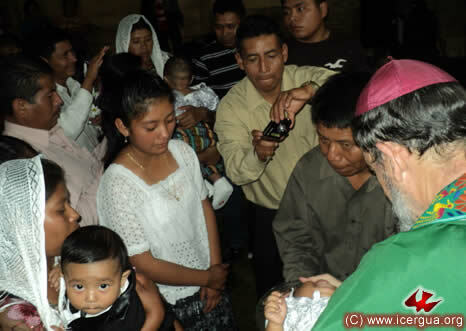 Left: The bishop presenting the child to her parents after the baptism. 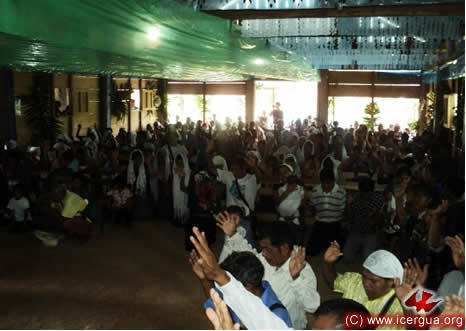 A large number of the faithful came forward to receive communion. All expressed a firm commitment to work for the growth of the community and to carry out fully the mission that the Lord has entrusted to them. 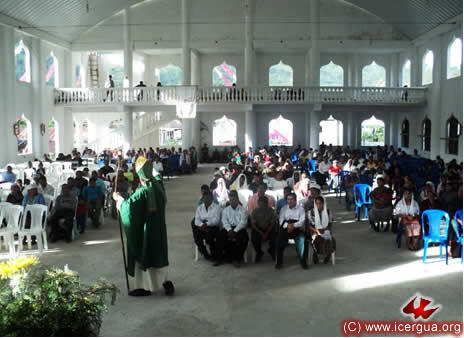 In the evening the bishop presided at the Eucharist and the Christian Initiation in the recently constructed church of San José in the center of Cobán. Only three months ago, the bishop had celebrated at the same place. Then, the property had just been acquired, and he came to preside at blessing it. Now, to the bishop’s surprise and joy, the celebration took place in the church built with splendor and love. As happens habitually, the liturgy began with administering the sacrament of Reconciliation for those wanting it. 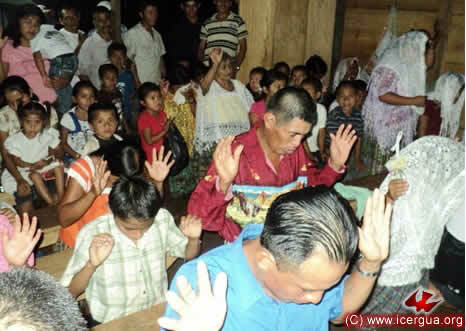 The complete Christian Initiation included children and young people. The young people, along with the parents of the other children, committed themselves to live out the faith fully. 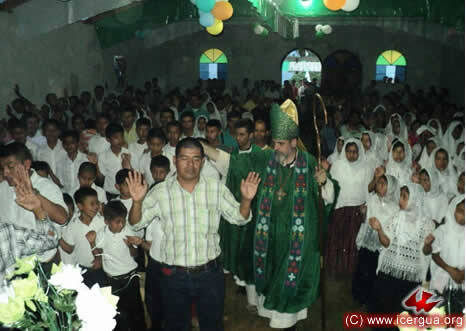 At the end of the celebration, the bishop, accompanied by Father José Ángel Nuñez, pastor of these communities, congratulated the faithful for all the steps forward they have taken and urged them to keep working to evangelize the nearby communities. 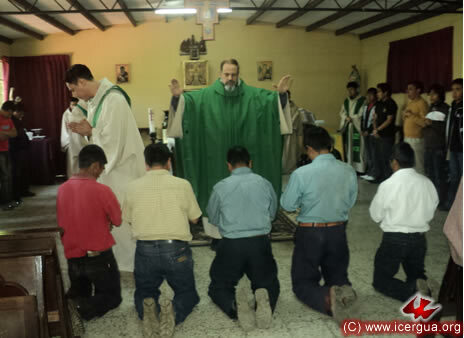 In the morning of August 29, the Deanery of Cobán took place in the Central Mission of the Village of Tomtem, the official residence of Fathers José Ángel Nuñez and Fredy González. Left: the representative from the Yaxacté, Lanquín, Parish is reporting what his parish has experienced in the last three months. The faithful were present in great number. In general a mood of happiness was felt and the experience of accelerated growth was shared. 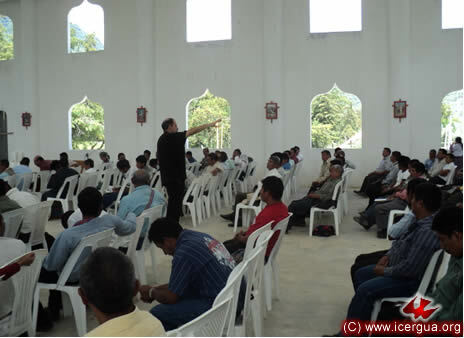 Left: The representative of the Esmeralda Community from the northern part of the municipality of Cobán, explaining the procedure that his community followed in deciding to join our Church. In the name of the community that he represents, he formally presented the request to be admitted. After the community leaders and the presbyters had made their reports, the bishop talked about the state of affairs in the Church as a whole, and introduced the study of the Third Pastoral Letter. 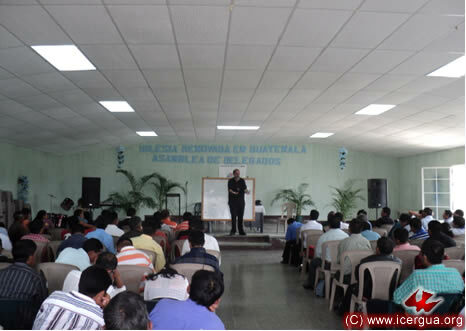 The faithful promised to continue working in evangelism and to study the Pastoral Letter in their communities. 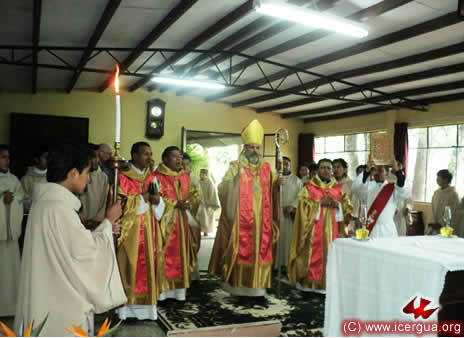 In the afternoon of August 29, a particularly significant feast was celebrated, which filled our bishop with joy. 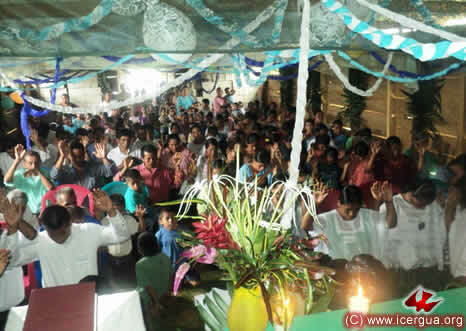 The community of Cerro Alto, Chiyó, in the municipality of San Pedro Carchá, was formally accepted into the Church. Comprised of more than eight hundred members, the community had been preparing this celebration for the past three months. Sixty-eight children made their solemn communion. Five Communion Ministers were blessed so that they could exercise the ministry of distributing the communion, the church was blessed, and the permanent presence of the Most Holy Sacrament was installed. 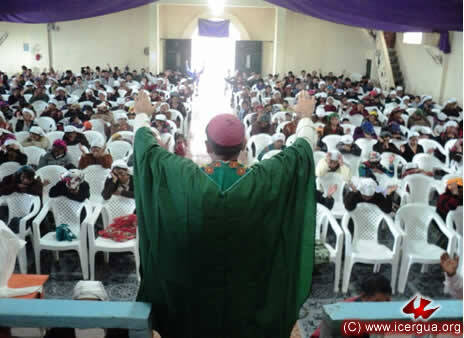 In the homily the bishop explained the characteristics of the Renewed Catholic Church. It is not a new Church, for Christ founded only one Church, but it has the goal of rediscovering and making fully present that same Church that was born at Pentecost, with the same organization, worship and identity that prevailed during the early years, but without the adulterations that infiltrated other ecclesiastical organizations and that have distanced them from the one, holy, catholic and apostolic church. The moment of blessing the Communion Ministers was particularly significant. The eyes of many members of the Assembly were full of tears prompted by the emotion accompanying the permanent presence of the Most Holy Sacrament and the knowledge that they could have communion even when no presbyter was present to celebrate the Eucharist. The children that attended communion for the first time did so with great seriousness and devotion, as can be seen in the photograph at right. Toward the end of the celebration, the church was blessed. The bishop walked through the aisles sprinkling holy water after the prayer of blessing. 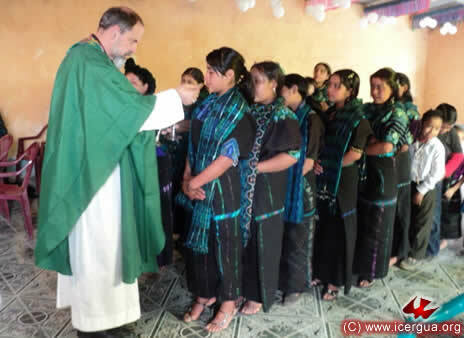 At the end, the young missionaries of the community, who had been responsible for the catechetical preparation of the children, asked the bishop and Father José to have a photograph taken with all the children. Their joy and piety was palpable.